Could West Seattle Have a Tunnel – and Housing, Too? The West Seattle Link extension was promised to voters as three stations (Delridge, Avalon, and Alaska Junction) running on an elevated guideway. 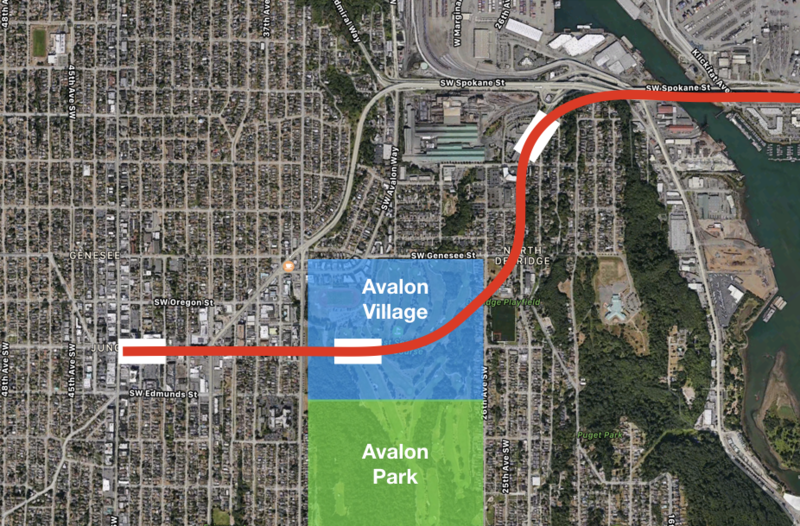 Some West Seattle residents are advocating for the removal of Avalon station to pay for a tunnel under the Junction. Sound Transit has pushed back on this idea, arguing that removing a station is inconsistent with the voter approved plan, and that routing the train through the golf course would be frowned upon by the FTA, which doesn’t like infrastructure projects befouling local parkland. But what there were a way to keep all three stations and afford a tunnel under the Junction. Could West Seattle have its cake and eat it, too? The West Seattle Golf Course is on land owned by the City of Seattle and leased to a private operator. (This public-private partnership, which has the residents of Green Lake somewhat freaked out, is widespread in the Seattle Parks system.) The City could, if it wanted, terminate the lease and do something else with the land. As local writer Rachel Ludwick has argued, our city’s golf courses are underused and, given our housing crisis, possibly not the best use of public land. Architect Mike Eliason calculatesthat using just half of the 120 acres of the West Seattle Golf Course one could house 7,500 housing units (at roughlythe average density of the new 5-7 story developments at the Junction) even while keeping the other half as a park. The answer, then, becomes clear: shutter the golf course, sell half the land to developers, and use the proceeds — which could be several hundred million dollars at today’s multifamily land prices — to finance a short tunnel under the Junction. Keep the Avalon station right in the middle of this new 7,500-unit transit-oriented community (Avalon Village, anyone?). As the land is developed, it would throw off millions of dollars for affordable housing in the form of MHA fees — perhaps as much as $100 million. (Of course, the city could opt to retain some of the land and build public housing directly, but then it might not raise enough to finance the tunnel. A balance would have to be found.) Oh, and it would also make the Port very happy by avoiding conflicts with Harbor Island and Spokane St.
To be sure, there are problems with this scheme. For one, the golfers of West Seattle would surely be opposed. But the reality is that golf is declining in popularity (despite our golfer-in-chief’s best efforts). The City of Seattle is currently evaluating the future of its golf courses. Even in suburban Parkland, WA, outside Tacoma, a 146-acre golf course is about to be developed into just 388 detached, single-family, sprawl-inducing homes. Wouldn’t a 60-acre park that could be enjoyed by everyone be preferable to a 120-acre golf course used by a shrinking minority? Plant enough trees on the old fairways and there might not even be a net loss to the city’s tree canopy. More critically, if the city were to come into several hundred million dollars from property disposal, would a tunnel under the junction be the most equitable way to spend it? Probably not, but if it gets tons of housing built and keeps West Seattle residents from filing lawsuits to block it, it might be worth the trade. Is this a crazy idea? You bet. But one thing the last few years have taught us is that the city — and the region — is in a generational housing crunch. It’s time to think bigger. Nope, nope, nope. Trading green space for housing in the city is a losing proposition, and not in the public’s best interest. Convert the golf course to a public park, but do not sell it to off to finance a light rail station. To flip this cost on its head – how much would Seattle residents value 120 acres of public park? If they had to buy it back from developers 100 years from now, tear down the buildings, and restore the forests and watershed, what would they have to pay? Please find creative housing & funding solutions away from our parks, STB. Don’t trade, and don’t cut a tree. Plan to build vancouver towers on each of the greens for all four golfcourses. Pave the current cart paths as bike infra. Build one per till course is built out. Tear down the fences and the remainder of golf course truly becomes a park. t’s a net addition to useable Green space. I’m confused as to what you are advocating for here, but it sounds like a spreadsheet calculation of usability. I’d rather have a restored park environment without high rises, especially as the city becomes denser. ‘Net addition’ assumes that the city (and residents) don’t already own this park land (which golf courses are). Changing the usage to non-park land is a net loss. Sure, it is a net loss, but for the vast majority of Seattle residents, it is a net win. Right now the park isn’t used by that many people, because not that many people golf. Do you see young families, with strollers? Do you see old folks, making there way down the paths from the assisted living facility across the street? * No, of course not. From a practical standpoint, it is like a display case full of expensive toys — nice to look at, but useless to all but a few rich kids. Adding apartments while converting the rest to a park would change that. Not only would the community get a real park — a park that *everyone* can use — but more people would be able to walk to it. Done right, and it would not only provide a lot more in the way of usable parkland, but it would knit together neighborhoods, which is very important. Right now if you want to walk from one side to the other, you have to go around. Sure, in an ideal world (from the perspective of parks) it would all be a public park. But that isn’t likely to happen anytime soon, if ever. Look at Jackson Park. It sits close to an urban area, in a location that has far fewer big parks. Yet no on is talking about converting that golf course to a park, despite the advantages from a recreational as well as pedestrian standpoint. The transit station — and the development next to it — is just the impetus needed to change this to a real park. *On a personal note, my mom actually spent a lot of time at Brookdale (before it was called that) and would have loved to walk across the street and access a park. Even if that section of the park was mostly housing (and lead into parkland) it would have been much nicer than a typical walk she took (which involved more walking on bus 35th, and the streets around there). Why not just make all of West Seattle a huge park. That way no one can live there. Cut the hyperbole, West Seattle will get built up just like any other portion of the city, especially with light rail coming. I’d be curious to hear how much park is ‘enough’ for current and future residents. This park land would never coming back with this proposed development. Non-golfers can’t really use this “park”; they can only look at it from afar. And what they see is basically a huge lawn dotted with golf holes. That feels to some more like an outdated suburban yard than an inviting space like Cal Anderson Park or a native-plant habitat like Seward Park or the new bioswales. 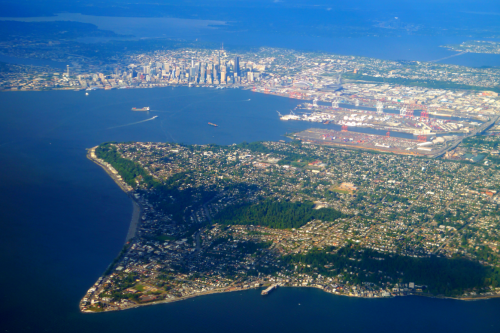 West Seattle already has two great parks, one called Lincoln and the other called Alki. There are also several woods in the interior. Why do we need a golf course too? There’s a golf course at Jefferson Park. Exactly. Golf courses are “parks” in the same way that empty lots filled with grass are parks. Actually, golf courses are worse because they use tons of water and chemicals. I’m not advocating for golf courses, I personally think it is one of the most wasteful uses of land and resources. I am against turning potential future park lands into housing. Keeping it as a golf course (for now) retains that future potential. It’s not a park. It’s a country club for people with money. I am no fan of golf, but a “country club for people with money” is not a name a would peg to Seattle’s public golf courses. I don’t golf and I’ve never been to West Seattle golf course, but I have played at Interbay’s putt putt course on a few occasions with friends. It was something like $10 for a round of mini golf AND a pint of beer, which is about as cheap an activity as you can find in the City. The clubhouse was clean and nice and the golf course appeared well maintained, but it didn’t seem like a place where rich people are hanging out. Golf courses may be a waste of space, ecological disasters and a dying breed deserving of extinction, but “country club for people with money” is best directed at courses like Broadmoor, not Seattle’s public courses. I do agree with Johnny5’s opinion. Convert the golf course(s) to park, open space or whatever public amenity makes sense, but do not sell it off. Open, public land is extremely valuable and we certainly aren’t making any more. Meanwhile, more housing can (with enough willpower) be built literally anywhere else. Hell, use the golf course as a bargaining chip to upzone more of West Seattle if needed. any increase to density in West Seattle in my mind would be worth-while…. but why not also look to terminal 5 also? yeah yea yeah port of seattle has control of it… and yeah seaport access but honestly, this large terminal being un-used for the most part for so long I think needs to start to raise the question: When should we consider reuse? having light-rail in planning is a great oppurtinity for redevelopment and would open a large swath of land to high-density housing development. I’m in an industry where, once upon a time, you mingled with people from your industry at golf outings. Thank God those days are long gone, as I couldn’t swing a golf club and hit the ball, if my life depended on it. Given the budget constraints that Millennials face, we can’t afford clubs, or green fees, or golf lessons, its a very wealth-centric sport that excludes anybody from a modest background. Can I afford to show up to a craft beer tasting or a construction site tour? Yes, I can afford that, and I don’t need to practice that like I would golf. Please eliminate the golf course. Make it anything else. Apartments, businesses, a dog park, some baseball and soccer fields, a forest, a skating rink. Literally, anything EXCEPT a golf course. It might make sense to just rank public spaces by usage and repurpose the under-performers. Seems like that is what you are advocating for. Like Metro’s performance metrics. Every year it looks at the bottom 25% and considers shifting resources to the top 25% underserved corridors. That’s not always visible because some routes remain for coverage reasons or because Metro doesn’t take the advice (it doesn’t have to), but it keeps things from stagnating without being reviewed. Hey, while we’re at it, Key Arena and the Zoo are public assets, yet are used by a minority of Seattle residents and fail the equity test by charging admittance fees. Bulldoze them too? Looks like next on your list is to fill in Greenlake and put in 10,000 affordable housing units with no parking spots. Yea, let’s do it. Or maybe even put “Avalon Village” in the middle of the golf course, so that there are two 30-acre parks left instead of one 60-acre park. Or even a “T-shape” to create 4 parks. For reference, Cal Anderson Park is under 8-acres. More parks (so that more people can walk to them) are better for a city than having a handful of enormous ones (not that enormous ones don’t have unique value, I just don’t think an old golf course is on par with a Central Park/Golden Gate or even Seward or Discovery). I seem to recall that there’s a law or rule of some kind that requires that any Seattle park land that is lost (due to development, etc.) must be replaced at 1-to-1 land area. So this deal may require buying up more land elsewhere in the city for parks. Can someone else confirm this (I did a few google searches without success, but I’m nearly certain I have read about this rule). Why does the replacement land have to be bought in the city? Why not buy up some land just outside the urban growth area, and make it a county park, preserved primarily for the purpose of fighting climate change? The Port of Seattle would never allow this, but there is land just northeast of the golf course that is only used for railroad car storage for the Port. You could put a pretty good sized park directly above that and not impact the Port. You’d not be able to have huge trees but it could be something like the sculpture park. Make it an extension of Jack Block Park southward. No net loss of land use but a net gain in public open space. Thirty-some years ago, we got the first Downtown Seattle Transit Tunnel through an old and crowded city, stations and all in two years of boring and cut/covering. After a year relocating utilities. Somebody on the North Link team: haven’t three decades made a tunnel under The Junction a lot smaller of a deal than a viaduct? Maybe enough that we could either rotate the crop from golf to world-cup soccer. Would say marijuana, but now that it’s legal, would probably need Federal subsidy.So how about planting it with whatever crop produces the most oxygen? I like the idea, but fully expect it would be blocked by some sort of “Save the Parks” type opposition/lawsuit over converting green space in urban development. Or in this case, converting “greens” space. Look how a few people in Chicago blocked a $1B privately museum in Chicago that was going to go where a current parking lot (in the museum district) is situated based on the premise that the parking lot is within public parkland. Sorry for typos. Hope you get the gist. Yes, the whole thing would hinge on some kind of mutual agreement whereby residents agree not to sue in exchange for getting the tunnel under Alaska Junction. I’m not sure such an agreement is practical or legal or enforceable, which may be the fatal flaw in this whole scheme. If someone wants to drag this out, they probably can. The couple of SW council meetings I attended, the various neighborhood group leaders and the WS chamber joked openly about how they would force a tunnel out of ST, because northgate got one, there is no compromise to be had there. Has STB worked with any lawyers (much less contacted one on one of your posts)? That’s how “Northgate got a tunnel”. Don’t you just despise the sort of people who hijack political decision making with their self-serving lies? It’s a disease that is assuming epidemic proportions. “somewhere around Eighth NE and NE 65th Street”. We’ll have to see how much opposition there is. There may be more; there may be less. As the housing crisis becomes more critical, people are stating to change their mind. They may decide that they can tolerate development on a golf course if it doesn’t affect anybody’s single-family house. Sounds good to me, although I see a few issues. One is the distance between the Avalon Station and 35th/Avalon. There are really two different reasons for the Avalon Station. The first is to serve the handful of apartments over there (which are a pretty long walk from the Junction). The other is to serve the 21 (or buses like it) without forcing it to detour to one of the other stops. Based on the map, there isn’t an ideal transfer from 23rd, but it looks like it could work. You probably have to build a path on Alaska Street (east of 35th) down to the station (followed by more escalators down to the platform). I’m sure ST would study this issue in depth, and report back on how long it would take to walk from the bus stop to the train stop (snark). The other question is whether it would be close enough to Avalon to satisfy the folks that expected a station there. It seems to me that if anyone has a case for a lawsuit, it is those people. ST made it clear they were going to build an elevated line to the Junction and that would include a stop on Avalon. If they deviate from that plan too much, then I think they are more prone to lawsuits then if they just build it. Then you have views, of course. There might be enough of a drop-off to where it doesn’t matter, but ironically, one of the few public park spaces available right now in the area is Rotary Viewpoint. You might wipe out its view. A new park to the south (with similar viewpoints) could make up for it, but there might be some complaints. Oh, and what about the stadium? Would you keep it or not? Either way, I think you would have to improve access through that area, so that folks in Avalon don’t have to go well out of there way just to get to the station. All in all, it seems like it could be done, but it would require a fair amount of planning by the city to get things right, and avoid big complaints. Not sure if we have the leadership in this town to do that. Put it to a referendum! That would mostly solve both the lawsuits and the political debates. I used to think such tactics were manipulative, but with the surprising nature of behind-the-scenes lobbying in Seattle, a referendum seems to be a fairer way to go. I don’t see how you could put an agreement to not have neighbors sue up to a referendum. The referendum result could be evidence in a lawsuit, but in common-law countries anybody can sue anybody for anything. The court may refuse to hear it if the plaintiff doesn’t have standing in the affair, but you can’t categorically block it. Um, has anyone done a realistic calculation (BTW, the monorail supporters thought their math would work as well)? This is not an official proposal, it’s an amateur idea. What we’d like is for ST to study this and others so that we can get some expert numbers. This issue also goes beyond ST’s authority (taking parks and redeveloping them) so the city would have to partner in the study. Nope. That’s a historic course, laid out by a notable architect, and the best public course in Seattle. I’d happily donate to a legal fund to tie this terrible idea up in litigation until it dies, and I suspect many others would as well. What percentage of Seattle’s residents visit one of Seattle’s public golf courses at least once per year. Your answer will tell us how important this country club is. You’re very confused if you think that a big city municipal course is a country club. I spent a lot of time hacking away there as a youth with my motley assortment of Goodwill clubs for like ten bucks a round. The city maintains land for lots of activities that only a fraction of the public actively engage in. Not a good argument for getting rid of them. As a low income youth, I played on municipal courses, I couldn’t afford fees at private ones. And I used clubs from Goodwill as well. Besides, we pay for p-patches which benefit probably even fewer people than golf courses. Brad, see my post above. Didn’t Fred Couples grow up/play Jefferson park as his first course? Brad – my quibble is with the comparison to pea patches. Anyone and everyone is allowed to stroll through pea patches, and it is quite a fun thing to do, and a great addition to your block/neighborhood if you’re lucky enough to have one. The one time I tried to include Jackson Park golf course (the paved trail) on one of my runs I was run down by a rude employee and shuffled right out of there. Gwed, I guess it’s all in the eye of the beholder. I view a p-patch from my window and walk through it everyday. (It’s a small one). I guess I don’t find other people’s gardening very interesting, but you make a good point, one cannot just stroll the golf course, as one could with a p-patch. Though I still feel like they mostly benefit a small group of people who want to garden, which isn’t a terrible thing, but I don’t feel like they are particularly awesome for “recreation” for the general public. It’s not a country club. Country clubs are defined by the people they exclude (non-members and the non-rich). This is like a community tennis court or swimming pool. There’s a nominal fee to pay for staff and maintenance, “membership” is just a name for a quarterly or annual pass, and the entity can’t discriminate against applicants who pay the standard fee. The difference between a golf course and a tennis court/swimming pool is that golf courses take up a lot of space, and their current popularity is behind the other two, so that the space per annual user visit is large. If it were a house we’d say it’s undense and sprawling. There are also environmental issues with monoculture, a non-native grass species, runoff, not a good habitat for native creatures, etc. Then there’s the housing crisis, with average rents above $1200 and people being turned away from Seattle. All these are reasons to convert a golf course adjacent to a central transit station into something else. But it’s not a country club and it’s not socially exclusive like they are. P-patches are neighborhood gardens, providing what many consider an essential service to areas where many people don’t have yards, plus their aesthetic benefit which is a lot more than a lawn. And allotment gardens were essential during WWII and before the modern food industry, and may become essential again. They are necessarily scarce because we don’t have enough land to give everybody a garden, but they fulfill a more basic need than a golf course does. Probably not, but if it gets tons of housing built and keeps West Seattle residents from filing lawsuits to block it, it might be worth the trade. Is this what our light rail build out has become: catering to a small minority that is threatening to sue to stop a much needed, life changing mass transit system, because it isn’t exactly to their unreasonable standards? We’ve already gone through this exercise once with Mercer Island, which ended up with a net neutral outcome for Mercer Island and a net negative for the rest of Sound Transit’s taxpayers. Let’s not go through this again. Either Sound Transit and Seattle need to stand up to the “tunnel or nothing” crowd or the (assumedly more reasonable) rest of West Seattle needs to speak louder than the litigation-happy minority. If West Seattle ends up obstructing light rail, their funds should be shifted to a City or neighborhood (within the same Subarea Equity of course) that will welcome light rail with open arms. They have environmental law on their side. The golf course exists, the light rail is a new use so it’s on the defensive. ST can’t prevent lawsuits from being filed, and it’s expensive and time-consuming to defend a lawsuit even if you win. That would probably be illegal, politically-motivated discrimination. West Seattle is paying ST taxes and has equal right to be considered for investments, regardless of whether the community makes it difficult or files lawsuits. Look up Seattle Ordinance 118477. This also means the City Council can never, ever dedicate another large plot of land as parkland, since it would then have to budget for maintenance in perpetuity. The mayor and city council can repeal an ordinance or add an exception to it. Look to see what the candidates’ positions were/are in the next election. 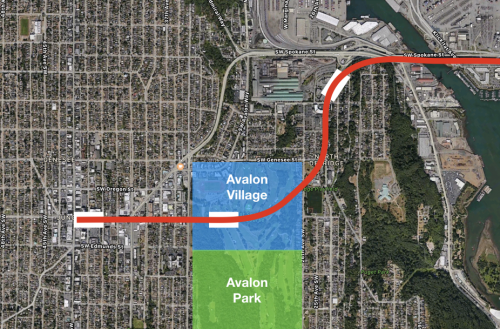 Ah, so we can dispense with the out-of-scope proposal to skip Avalon/35th for a tunnel halfway between the two main north/south bus corridors, by cutting through the golf course. Thanks. Good to know. We can debate whether a golf course makes sense or should be repurposed to a different kind of public amenity, but do not sell/lease/etc. potential public open space for private development. Full stop. The dirt is too valuable, almost priceless. If a developer has comparable or better open space in the same neighborhood they want to swap, that might be the only consideration that makes sense. It’s not only the developer who would benefit. It’s the residents who would live in those apartments. And the city as a while has a public interest in housing its residents. I see your point about not converting irreplaceable open space, but whether it’s leased to a private entity or the city builds and owns the housing is a secondary issue. Agreed. As our area increases in density, land is only going to increase in value over time. For that reason I think that selling off public land will prove shortsighted over the long run. However if there’s a plot of publicly-owned land that is not needed for any public purpose in the immediate future, I do support ground leases. Allow a private developer to rent the land for a particular time (perhaps 50 or 100 years), build on it, and collect rents from the improvements. At the end of the lease the whole thing would pass back into the public ownership. The Seattle Public School district has employed this option in a few different places. The Wallingford Center and Oak Tree Mall are two examples of this, land that is being given to private use for a particular time, but will eventually become available again to build schools in the future. People will chain themselves to the trees before they let the city sell dozens of acres of public land for private development. It’s already leased to private golf course developers. If you want it to be public land, get the golf course off it first. As one of the people concerned (indeed, freaked out) about parks privatization agreements such as those proposed at Evans Pool / Green Lake and signed at Asian Art Museum, I would like to point out that there are important differences between these agreements, and it is a misrepresentation to say that privatization opponents oppose all public/private partnerships. Compare to the agreement signed at Asian Art Museum. The City has entered into a 55-year agreement with the private partner (Seattle Art Museum) to provide rent-free use of a City building, plus operating support payments from the City to SAM (which increase with inflation), plus $19 million in capital funds from the City, plus the City’s agreement to pay for all major capital maintenance needed. The 55 year term enables the sale of historic rehabilitation tax credits — purchasers want to see collateral equivalent to “ownership”. The City has no option to terminate the 55-year agreement unless SAM is in default of its obligations (except that the agreement cannot be terminated for any reason within the first 5 years even if SAM is in default). We have lost for 55 years the public’s ability to determine the use of this City property. This very long term creates generational inequity in which the people who made the deal will not expect to live out the full term, while the deal’s greatest costs are borne by the youngest community members who had no say in it. There was not even an appraisal of fair market rent (with free parking provided) to determine the public cost of the deal, but clearly it greatly exceeds the City’s financial benefit plus tangible public benefits such as free admission. There are many types of public/private partnerships. Small community based nonprofits operating in parks property, such as pottery studios, pay market rent (established by independent appraisal) with a credit for tangible public benefits such as free nights and low-income scholarships. Partners such as ARC are successfully operating under financially balanced agreements. But with big politically connected nonprofits such as SAM who have the ability to provide capital funds (and whose other two locations are also City-subsidized), the City is seemingly willing to provide a public subsidy wildly in excess of the partner’s tangible contribution. It is this, along with the long-term loss of public control, that I am opposing as an anti-parks-privatization advocate. I suspect the City could cover its golf operating expenses if it owned ONE golf course, but it owns FOUR, which is absurd considering the low popularity of golf. Pick one and convert the rest to something useful. Let the golfers vote on which of the four survives, but tell them only one survives. Use approval voting, and whichever gets the most “this should survive” votes wins (but if you vote that they should all survive, your votes cancel each other out). Pick Jefferson Park. I don’t know how good it is for golf but it’s the best one from a citywide perspective. West Seattle and Jackson Park are right at a central Link-bus transfer hub that could have housing within walking distance or people coming to a park from several routes. Interbay is not a transfer hub but it’s right in between two large urban villages and adjacent to an emerging small one. But Jefferson Park is south of Beacon Hill village and station, and further south there’s only larger houses until the road peters out into an obscure turn down to Rainier Beach. So Jefferson Park is not in the way of anything, and its center parking lot where the streetcar line used to be is kind of cute. I wonder if a build-and-cover option would work for the light rail line — like what was done for I-90 in Mercer Island. It would seem to be a good way to both get a tunnel and keep the golf course by re-sloping a few holes. I’m not sure if the idea of an aerial rail line against a golf course is such a good idea anyway; won’t golf balls go flying through the windows occasionally? Put one of these sites next to station: https://topgolf.com/us/ ( requires13 acres). 5 acres for station. Convert remainder of golf course to 100 acre park. Create 20-40 acres of housing. Total 140-160 acres. To make up the difference annex 20-40 acres of nearby property (land that mostly would have otherwise been acquired through eminent domain if not for the tunnel). . Between Jackson Street and about Century Square Building, we bored the DSTT. But curving eastward under Pine, there wouldn’t have been enough dirt between the tunnel roof and the surface to hold a bore. I think rule is full tube diameter. Under golf-courses, tunneling is generally governed by the rules of small furry animals eating worms. Possibly the classic patterns the roofs of these tunnels leave in the grass could be scaled up to accommodate foundations for miles of linear TOD. But also wonder who might give us the money for a West Seattle subway with Russian Classic stations in return for a country club. However, if he’s got a teenage daughter with a tailored red jacket, shiny black boots and a Redmond address, LINK better make horses service animals. Riding crops work better than mace. Oh, come on! If anybody who’s helped bore, or cut-and-cover, a tunnel, or been on a work crew on the viaduct from Rainier Beach south just gives us a couple of paragraphs, I’ll go ‘way. Just trying to make the point that neighborhood politics are not the only factor to consider in building a railroad. I guess I didn’t make myself clear enough. I’m talking about building the rail at grade (just enough digging for the ballast) and then adding a lid to restore the golf course holes to permanent use. The lid only has to support grass and maybe bushes on top and not any buildings. Very interesting idea and worth further exploration Rather than permanently alienating the development segment, how about “ground rent” UW downtown-style? 99 years is a long time, capital-wise. Even if this is unlikely because of the city law against converting parks, the federal law against impacting a park, West Seattle opposition, and general old thinking, it’s good to document the tradeoffs the city is making and articulate what we’re missing out on. MAX orange line was built directly above a city park at the south end of Milwaukie, so I’m not sure how severe that impacting a park thing is. The golf course isn’t a park, which might get it exempted from the federal 4(f) rules, but the federal 4(f) rules are quite ridiculous. They *only* apply to the federal Department of Transportation, so if you use local funding and don’t need DOT approval, you can ignore them. You can also ignore them if you’re building housing, which doesn’t require DOT approval. So, weirdly, convert the golf course to housing first, then build the train tunnel, and you avoid 4(f) problems. Building on the golf course land is a great idea. Further density within a city is always superior to sprawl. Of my generation, many people can’t find homes within a reasonable range from the city. It is unfortunate to lose our friends either to other cities or other countries. Golf is not an activity that is either strenuous or with popular appeal. To be able to replace it with the west Seattle version of the spring district would be great. Your proposal is far from being a crazy idea. While I think it’s important to note that the Seattle Ordinance would require replacing with parkland elsewhere — that just means less cost savings. I think there is plenty of positive in converting this golf course to a more useful park for city residents, plus added housing and density which we are desperately in need of, plus not taking on the cost of acquiring all of the existing housing (not in a SFH zone, by the way) by cutting through the neighborhood instead. And if it means we have to produce some more parks space elsewhere around the neighborhood, I think that is also a good thing as we need more green space interspersed where we are increasing density. Where in the city is there available land for a park that big? This isn’t a one house-lot park. An acre-for-acre land swap seems to be a good idea. Could also be applied to a sliver of the Jackson Park golf course facing 145th. Exchange some of the land adjacent to new stations for TOD development in return for new parkland in other neighborhoods. If we can add parkland to neighborhoods currently under-served with open space, then that’s a win for equity, no? Personally, I’d rather have several Hiawatha Playfield sized parks spread throughout multiple neighborhoods than one big park. If this can’t be done, how about shoving the park and ride lots under the golf course grass? That way, at least the Junction end off things would have some massive parking garage. It’s not like the grass areas have particularly deep roots or anything. There are no P&Rs currently planned for this extension. Why bury them if you don’t have to build them at all? I had thought there was some sort of parking structure planned for the last station on the line. If not, that’s wonderful. ST3 funds zero parking within Seattle. There’s a small P&R under the western approach of the West Seattle bridge, which is further east. Parking lots are an EYESORE. We can’t have that. I don’t know the West Seattle NIMBY population that well, but isn’t the golf course something they might want to keep around? Do folks think that more development of a park/golf course would survive an EIS? Is there anyone at STB with a legal or environmental law background? (I realize this may fall on deaf ears, like my request to interview Ron Kubly on SDOT’s thinking regarding ST3). But are there environmental folks who want to chime in? Main point about cut-and-cover vs. “mined” (I think that’s real term) is that I really do think that we’d have better luck with the communities if we really had a mining engineer at public meetings. Especially with residents over 60. People who still remember how you can smell an overheated bearing before your wheel breaks off – which you can’t do yet with virtual, at least ’til somebody figures out a way to add scent to touch-screens in addition to sound- might find it more comfortable to deal with about projects that involve digging and elevating. Hope it won’t soon be necessary to return P-Patches to what WWII called them: Victory Gardens. Not sure if this was really Department of Defense, which used to be called the War Department, or mostly to let civilians at least feel that they weren’t helping the War Effort. Because “Miserably Misguided War That We Got Lied Into And After Losing 50,000 Troops And Killing Countless Civilians Flew Out Of With Our Allies Clinging To The Skids of Our Helicopters” Gardens, Or “Tonight We Don’t Want to Think About It!” Gardens, don’t carry same morale. Better stick with “Thanks But Your Dog Doesn’t Need to Fertilize” Gardens. And either find some engineers or get gray hair spray at costume shop, rent a hard-hat, and let an events worker just sit there and give straight answers in monosyllables. Damn! Supposed to be “WERE helping the war effort!” Will wait ’til next Open Thread to get some really god-awful current events On-Topic like the rest of saving our country should be. Those Swedish and Finnish bomb shelters with subway trains running through them suggest a context. Truly would not hurt to have some food, medical supplies, and rescue equipment down there. And as many passengers and transit employees trained to use them. STB has always had the attitude of favoring development over parkland, or open space, in general, in the city. After all, there is a housing shortage, and an excess of golf courses. One of the few points I disagree with STB on, but in this case I think converting a golf course to half housing and half public park is a good idea on balance. I live about 100 yards from the golf course. It’s not a park. It’s an obstacle. If the golf course were a city park open to all, I’d have a pleasant 1 mile walk to Alaska Junction. Instead, I have chain link fences forcing me to get in my car and take the long way around. It’s a detriment to the neighborhood. The city wouldn’t be losing anything. The city would gain a 60 acre park, and get a more vibrant, walkable neighborhood in exchange. As a direct neighbor, I’d be very much in favor of this idea. Thanks for starting this conversation. I hope the city and Sound Transit will give this serious thought. I wouldn’t say that at all. We prefer dense development *precisely because* it leaves more open space for parks and other uses. I strongly oppose the idea of eliminating green space in Seattle, for just about any reason. Not only will future generations regret the loss, we people living right now will regret it. Turning the West Seattle golf course into a park, full stop, is an excellent idea. The golf course is between Camp Long and the Delridge playfields. It’s next to West Seattle Stadium. As a park, it would be part of an enormous West Seattle parkland that would be a regional destination. Like many golf courses, it is practically park-like already, with Longfellow Creek, trees, and meadows. There is an excellent trail system that runs north-south along Longfellow Creek, from the Seattle boundary at the south end of West Seattle to–this damn golf course. Right when the trail could be best, it ends and you have to walk on sidewalks around the golf course. I appreciate the misty-eyed remembrances about $10 golfing when you were a kid. However, it costs about $35 now at West Seattle. Golfing statistics show about a 10% decline in participation over the last decade. This decline is what is causing some golf courses to close around the area. There are actually seven separate golf courses within the city limits, if you include the two private courses at Sand Point and Broadmoor, and the Green Lake pitch and putt. To me that seems like an insanely high number of golf courses for a growing and crowded city to support. It does seem like the public courses are having trouble attracting enough business. Conveniently if 10% fewer courses are needed, then Seattle can stand to lose one. Whether that should be West Seattle, or perhaps Jackson Park, is for public discussion. From a golf point of view, West Seattle and Jackson Park are the two best public courses in the city. (If you want to subsidize the $80,000 it would cost to join Broader or Sand Point, I’ll shoot you an email, LOL). The pushback would come close to the head tax backlash. Which one’s better? There’s really not enough golfers to subsidize two public golf courses in Seattle, let alone four. Pick one, bulldoze the other three. In regard to public backlash to the idea of closing one of Seattle’s golf courses–it may be there would be significant pushback, but I doubt it would rise to the scale you imagine. My neighborhood had a recent discussion about turning Jackson Park into an actual park. The discussion was on Nextdoor, which has a conservative and seemingly older skew. (You only have to skim the many rants about transit and bicycles to realize this.) Anyway, the pro-park commenters outnumbered the pro-golf commenters by a wide margin. Many of the golfers were from well outside the neighborhood; outside the city in fact. The financial model for Seattle golfing seems ripe for change. From the golf course operator’s own website: “The course is maintained by the City of Seattle and managed by Premier Golf Centers LLC.” My understanding is the cash flow from golfing fees is barely enough to keep operations going, with no money available for maintenance of the property or capital investment. I have found it difficult to figure out from Seattle City budget documents exactly how much Seattle pays to keep the golf courses in good shape–maybe someone else will have better luck. But if Seattle is already paying for park maintenance, ending the golf contract on one or more courses will not involve any major expense for Seattle. It will simply change the park from a golf course to a park. West Seattle has the prettier views, but it doesn’t drain as well in the wintertime when it rains. West Seattle: not the strongest case for light rail, but will get light rail and likely a tunnel. Want to try and close their course down? Interbay is a 9 hole course with a driving range- but expect the Magnolia/Ballard/Queen Anne crowd would not be thrilled. Jackson Park– North Seattle pushback. Course serves (at least from what I observed anecdotally) a more diverse (more Asian-American) crowd than West Seattle. Good luck getting rid of one, much less three. Good points, Mr. Burke. I’d like to revise my comment above. As a neighbor, the best use of the golf course would be as a full 120 acre, publicly accessible park. The next best use would be as a 60 acre publicly accessible park, with 7,500 more households nearby to enjoy it. The least desirable use is the current one: 120 acres surrounded by chain link fence, there to serve only a declining population of people with an interest in an expensive niche hobby. This is the precise opposite of a crazy idea. It makes way too much sense. A little reality check: If you are a “rich person” you are not going to be golfing at West Seattle Golf Course. You are going to be at a private club. I don’t care what you do with the golf course. But don’t try to portray it as some sort of exclusive enclave.